In 1535 Henry VIII, Anne Boleyn, and Henry's right hand man, Thomas Cromwell, went on a royal tour. Henry and Anne stayed at nearby Sudeley Castle, while Thomas lodged at Hailes Abbey, founded in the 13th century. Below the center arch of the ruins in the photo above is a long washbasin. The refectory door, where the monks dined, is on the right. Before entering the refectory, the monks would wash their hands in the basin, which was supplied with rainwater from pipes on the roof. Perhaps Cromwell also washed and ate there, enjoying the hospitality of the abbot and the monks. Yet, on Christmas Eve in 1539 he sat on his horse on a hill above the abbey and watched as the destruction he had ordered began. The history that led to the dissolution of the monasteries is long and complicated, with intrigue, greed, desire for control, lust and romance tangled together. Hilary Mantel authored Wolf Hall and Bring Up the Bodies, which tell the tale of Thomas Cromwell, his ascent to power and his decline. On a warm July morning we wandered through the ruins, mostly alone, passing under arches and through doorways, trying to grasp the enormity of this place and something of the everyday lives of those who once lived here. I had always assumed that these massive ruins and others like them were constructed of cut stone. How wrong I was. Rough stones are mortared together in thick walls as seen above, which are then faced with cut stone. Much more efficient. Over the years, seeds lodged in the stones, took root, and grew so that the ruins appear to have tufts of fine, golden hair growing atop. Sheep pasture undisturbed by history on the hills above the ruins. There is an informative museum on the site that explains the Abbey's story in more detail. Water trickles through channels constructed long ago. Cow parsley waves in the wind, much as it did centuries past. Visiting history always leaves me with an awareness of my smallness in the grand scheme of things, but also aware that although technology advances, people's motivations and emotions remain the same. Very impressive ruins & beautiful photos. I don't remember much of Cromwell, have to google him... Have a great week. You can almost feel the history of Hailes Abbey leaking out through the fissures in the walls. I wonder how different a country England would be today if Henry VIII hadn't been so vain and egostical as to divorce Catherine of Aragon,break away from Rome and create the Church of England & Wales. Great post and a beautiful mosaic, happy MM. I have been to Hailes Abbey but a very long time ago. I think this was where we all listened to the Audio tour on big headphones ~ the kids who were about 7 and 9. They enjoyed the tour very much, we arranged to 'meet'at each point of discussion as our tours were ever so slightly out of step and they raced along with great glee!! Happy times. Wonderful photos Lorrie. Such an interesting and tragic history. A lovely place to visit I had forgotten how beautiful it was. You certainly got some great photos. I really enjoyed Mantel's books. Thanks for the look at present day Hailes Abbey. It brings history to life. Have a great week. A very interesting historical site; lots of info about the captured aspects through your camera lens. History is amazing and the place is so lovely to have a nice "travel back in time"; and you're right saying :"people's motivations and emotions remain the same". 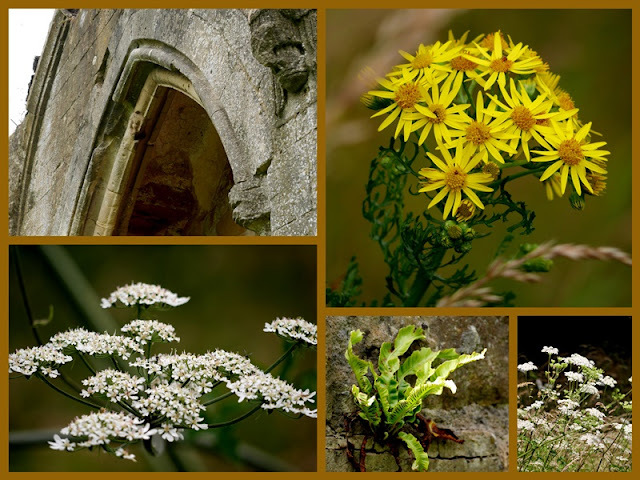 Many thanks for sharing these lovely photos and mosaic with blooms. HAve a very good day of october and week, as well! It looks so peaceful now, but what awful carnage when it was first destroyed. Fascinating. Did you feel an atmosphere when you were there, we have the ruins of an ancient ampitheatre half an hour from our house here in France and whenever we take friends to visit we can feel just what it must have been like, the old stones, imagining past times. I loved reading this, every word of it. Agree wholeheartedly with you about history and the grand scheme of things. Lovely photos. Wonderful photos of the ruins and thoughts about the grand scheme of things. Lorrie, thanks for sharing your trip photos. I love the arches. Amazing that some of the building still stands. Sylvia D.
You captured the ruins beautifully, Lorrie. I enjoyed the show, Wolf Hall, which presented Cromwell in a sympathetic light. Fascinating story. Love the ruins with the tuffs of hair. What beautiful countryside. Your telling of the story is marvelous. I'd enjoy your classes. Course some of history is so brutal it is hard to fathom. Even recent history. Beautiful photos and history lesson today! Thank you for the comment on my blogpost! Nice photos from ruins with interesting stories around. Beautiful arches in these history ridden ruins. History does repeat itself, doesn't it, again and again. Beautiful photos. Loved this bit of a history lesson. As an English major, my schooling especially for my MA was as much history as it was it literature. They seem to go hand-in-hand. The English countryside does hold many secrets and adventures. I hope you are able to weave some of your English adventures and knowledge into your school lessons. Beautiful photos. Thanks you so much. Looks a great place and steeped with history - it always amazes me how much history has passed by on the ground we stand on. Since I've never been, I so loved seeing the ruins through your lens, Lorrie. The tufts of grass did resemble hair sprouting from the stones. Thank you for sharing the beauty and history with us. An utterly fascinating place and wonderful photos and texts. Thank you for this fascinating tour and lovely pictures .... I could just imagine Cromwell enjoying his repast while plotting all the time about what would happen next. It was such a good touch that you showed the wildflowers blooming and the way the land beyond the ruins looked ... that is what made it feel like I was along for the tour, because I would notice that too.... so much more personal. Your last sentence perfect,y summed up my feelings when viewing (the many) reminders of sad history.